I am currently trying Ainsley Harriott’s Southern Cajun Gumbo Cup of Soup for breakfast. Yum! Some people ask what food I take hiking. This is too hard a question for ONE post but here’s a tip which also works well for a snack or lunch. Combine a sachet of 2 minute noodles sans flavour sachet witha cup of soup. 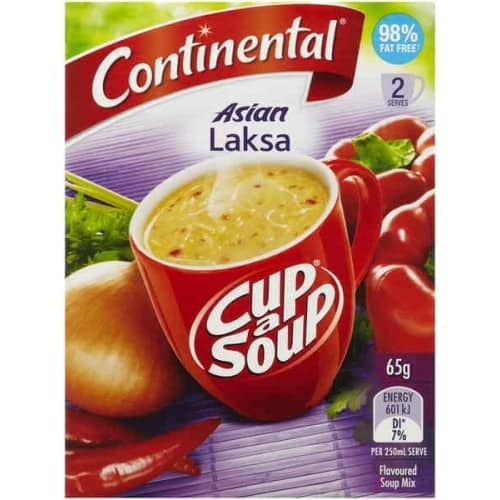 My favourite is Continental Asian Laksa. One sachet = 65 grams (147 calories) + 72 grams noodles @ 327 calories (plus a tasty warming chicken flavour sachet to enjoy later) 519 calories (137 grams) = 3.78 calories per gram carried!